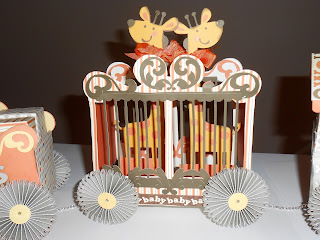 It is my pleasure to participate in the It's All About Baby Blog Hop, hosted by Miranda at Nana's Scrap Spot. As I'm the last stop on this great event, I'll make this a "linger longer" sort of post to describe my project in depth. 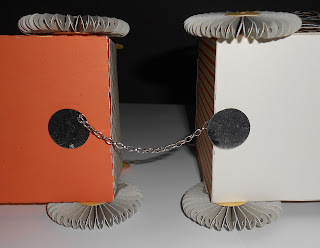 I thought of this project when considering what to make for a monthly "scraps to treasures" blog hop. I'd recently emptied a cylindrical container that held Panko bread crumbs -- and if you're like me, you'll relate to this: I looked at that container and instantly thought, "What can I make from this?" Starting with the engine, I covered the clean can with a wrap of the dotted Babycakes B&T Duo. I trimmed it out with the zip-strips on the edge of the designer paper. I made the engineer's house just by guessing the measurements ("eyeballing"). I decided to make windows all the way around, and cut them out using an X-Acto knife. I lined the windows with scrap acetate, to give the structure body. I decided to make the "nose" of the Engine using rosettes that I stacked on top of the removable plastic can lid, leaving the can empty for a gift onesie for baby. If I was feeling really industrious, I'd design and make the matching onesie -- maybe later! TIP: Oh, let me give you a hint on the rosettes: Normally, I'd make these using hot glue to hold them securely. But this year, CTMH introduced Adhesive Dots that are super-duper strong and WAY easier to use for rosettes. Really! Try them! 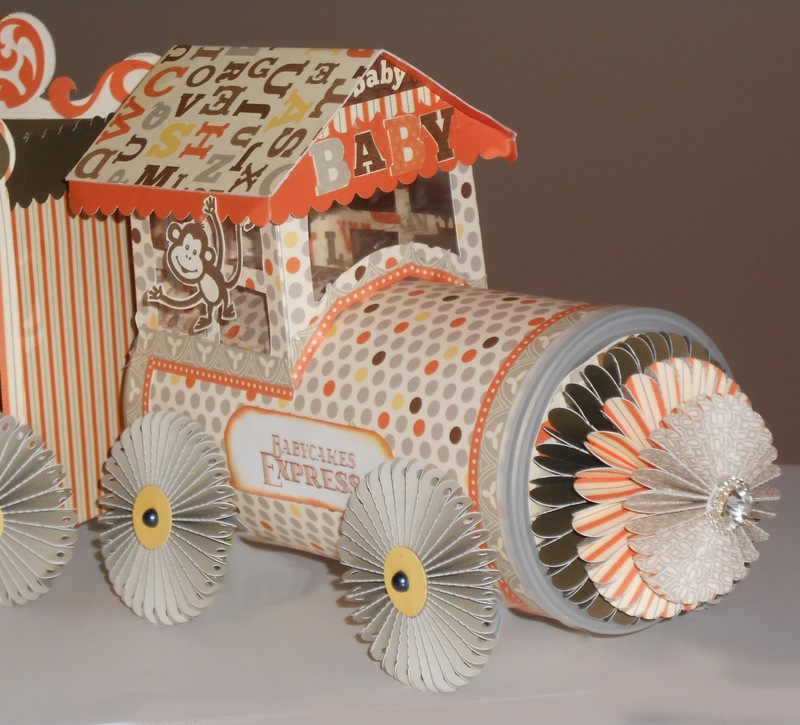 The wheels are also made with rosettes, these cut from CTMH "Whisper" cardstock. The monkey hanging from the roof is from the "Wild Things" CTMH stamp set. I dubbed the train the "Babycakes Express" and set the little sign on my computer, trimming it and inking the edges in CTMH Exclusive Ink in Sunset color. This car was cut on my Silhouette Cameo using a file purchased from the Silhouette Online Store. I had to manipulate the file a little bit -- and the Silhouette Designer Edition software makes this super-easy! -- to be the right size. 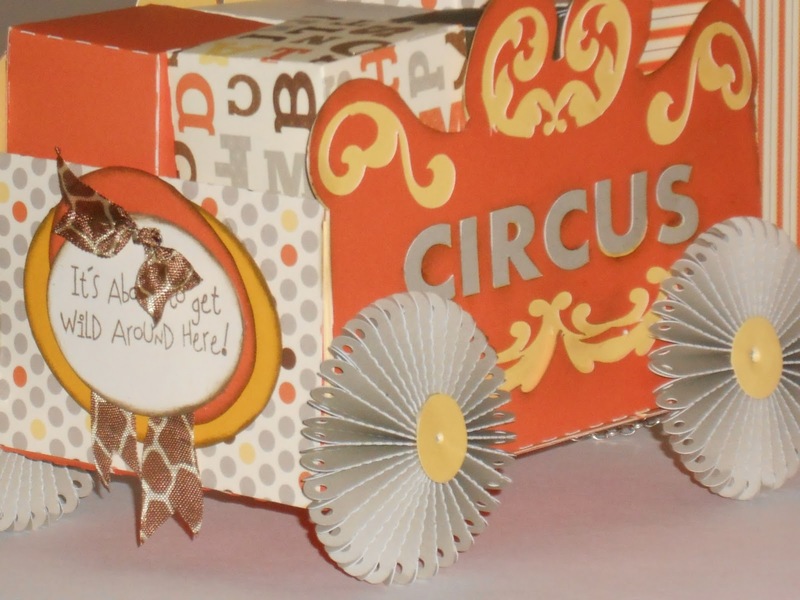 Again, the wheels are rosettes cut from CTMH Whisper cardstock. The adorable giraffes (love them!) are from the Cricut Create a Critter cartridge, cut in 7.5". I inked the edges of the giraffes, and also tied bows on their necks using yellow seam binding ribbon. For the "box car", I further manipulated the file for the cage car (above) by running the Cameo's digital "eraser" through the horizontal center of the cage. I joined the sides together digitally, added the word CIRCUS, and dropped the flourishes onto the swirled top edges. Pardon my pun (but I'm like that! ), but since this is a "box car", that is what this car holds -- a dozen 1.75" cube boxes that can hold candy or other baby gifts like socks, gift cards, binkies, etc. The back of the car has intentionally off-center stacked layers under a sign that says "It's about to get Wild Around Here!" I tied some giraffe-stained ribbon to the sign. It's wild! The only other detail that I want to show you is how I opted to link the rail cars together. I cut apart a CTMH "Base and Bling" Necklace to use the discs to be attracted to magnets I put on the railcar perimeter. Nifty, huh? 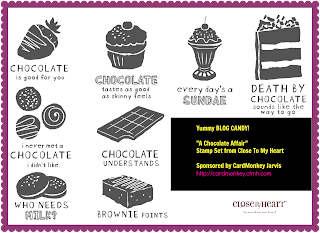 If you care to comment on my post here, and also choose to become a follower of my blog, I'll put you in the running for my delicious BLOG CANDY! You see, writing this post in this yummy brown color has gotten me thinking about ... CHOCOLATE! And I have an extra Close To My Heart "A Chocolate Affair" stamp set to give away to a randomly picked person who comments/follows this blog. As I mentioned earlier in the Hop, I'm the last (and not least) stop on this fun Hop. So there's no one to send you off to -- I'm just going to say THANK YOU for hopping along with us. Do come again! P.S. -- If I can help you purchase any Close To My Heart products, it would be my honor to be your Consultant. You can find an online catalog at http://cardmonkey.ctmh.com. Your train is so cute. My favorite summer activity is taking road trips to new places. I follow you with Google friend connect. Ummmm WOW!! What an adorable train!!!! WOW! thats an amazing train!!!! Every little detail is just amazing! New follower of yours as well! AMAZING!!! I love the rosette nose... the chain to link... the paper and of course that rumple ribbon!! What a great project. Where to begin - the train, the characters, the embellies, just everything shouts FUN - this will be a wonderful keepsake for anyone!! TFS! You get the prize for most creative packaging. How darling! My favorite summer activity is sleeping in until 7AM. wow your ideas are endless. Love this. Very cute train--I like your use of rosettes. My favorite summer activity is gardening and then cooling off in the pool. It was a pleasure being in this hop with you and I am now a follower of your wonderful creativity!!! This train was just amazing and so detailed!! my favorite summer activity is concerts in the park with friends. Such a CUTE train! wonderful idea. Thanks for sharing. This project is spectacular!! What a fun decorative gift....with all the little details you put in with love and care. I love giraffes, so those are my favorite parts...along with the giraffe print ribbon. Miranda wants us to tell you our favorite summer activity. Mine is gardening and eating what I grow. Yummy!! How lovely of you to offer such scrumptious blog candy. I am a brand-new follower by Google. Yippee!!! WOW! Adorable for sure! You have some talent there! I can't even imagine the work put into that. Thanks for sharing. My favorite summer activity is having my married girls home for visits. Just completed the hop...it was my 1st & a lot of fun. In the summer I love spending my time outdoors. With fall upon us I'm gearing up for a busy craft season. ok, here it is. FInally through the entire hop! I have no favorite summertime activity, I just scrap, lol.. so I didn't follow the rules :0 Oh well, just wanted to leave some blog lovin! Love this project...truly a work of art!! INCREDIBLE!!!! You were right on track with this train! Your creative energy/talent is always such a joy to look at. Love the little details and it's so funny you mentioned about the can since I just finished an oatmeal can and CAN'T throw it away !!! Loved my summer, enjoying piece and quiet in my craft room without any obligations! p.s. please add your gorgeous project to my Linky Party.